“You’ve got to walk before you can run” comes up often inside our office walls. With more than 1,000 employees, it takes time to get everyone up to speed on the ins and outs of the company, the culture, and the way we use Slack at Slack. Thankfully, that many employees means we’ve had plenty of new-hire classes to help refine our onboarding. Whether you’re on a team of tens or a team of thousands, here are a few tried-and-true ways we use Slack to set up our new hires for success—before and after their start date. When people accept a job offer at Slack, they get early access (two weeks before their start date) to a special Slack workspace created just for new hires, where they’re encouraged to use Slack, instead of email, for all communication and questions. They begin in a channel named for their start date—e.g., #new-hires-08-20-18—where they are greeted and given a list of other helpful channels and documents to review. We have channels that cover IT help and benefits. Soon, a scheduled set of messages are sent to them via direct message reminding them to finish their enrollment in our HR system, upload a photo to their profile, and post a paragraph about themselves in an introductions channel. A few days before they arrive for their first day, they’re given a set of instructions on how to get to the office, a guide to San Francisco, and some hints on where to eat, including a channel to ask questions. The knowledge-base app Guru also comes in handy here, as we share reading lists before their start date to help them get acquainted with the company. Right away, they’re in a place where they can ask any question without feeling intimidated by a crowd, browse questions from other new hires, and get one-on-one assistance from HR. They’re also safe to test out and play with the product without interrupting a busy workforce. We extend this process to our interns, often months before they arrive for seasonal terms at the company, and we quickly found that conversations on Slack inevitably helps people form into groups—sometimes even finding housing together—making their transition to a new position easier. Right away, they’re in a place where they can ask any question without feeling intimidated. Everyone gets access to the main Slack workspace on their start date, and their first week of onboarding includes sessions on how best to use Slack with the whole team. But thanks to their previous two weeks of getting acquainted with the product in the new-hires workspace, no one has to start from zero (and new hires can stick around on their special workspace for up to two months afterward, to answer any lingering questions). For companies of more than 1,000 employees, creating another workspace is a good idea to give new hires a safe, separate place to get acquainted. For smaller companies, you can replicate this on a smaller scale by making all your new hires single channel guests in a #new-hires channel that replicates the same sort of space for introductions, discussions of benefits, and sharing information that helps them get started before unleashing them to the rest of their Slack workspace on their first day. A first week at a big new company can be a whirlwind, and you don’t want to overwhelm new hires with too much from the start. At Slack, we set reminders for once a day during the first week, then once every few days after that for the remainder of the first month. This way, new hires don’t have to tackle a pile of paperwork on day one; instead, they’re getting one task at a time to finish up at their own pace. 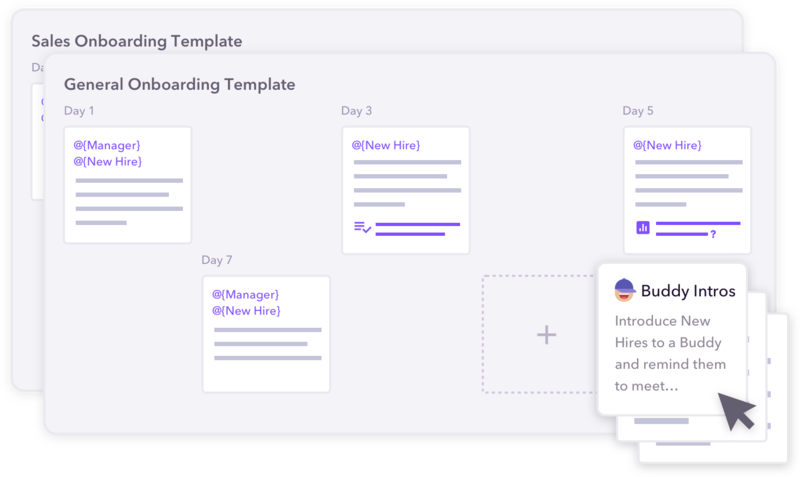 We also offer additional onboarding tracks tailored to specific teams like Sales, Engineering, and Customer Experience. Beginning in a hire’s second week, training sessions teach everyone about the specialized tasks, tools, and information necessary to do those jobs. Donut allows you to customize onboarding content by department, role or location. We rely heavily on Donut’s Onboarding bot to help us automate all this in Slack. Donut lets our People Operations team schedule specific messages to send on specific days, and we can run polls to gauge the mood and effectiveness of the lessons they’re receiving. Not every decision has to be made on the first day; it’s good to let people figure out how to navigate all their benefits and options over the course of a month instead of packed into their first eight hours. For larger companies, consider a separate workspace for new hires to get used to the organization, while smaller companies can rely on the guest features in Slack to create specific new hire channels. 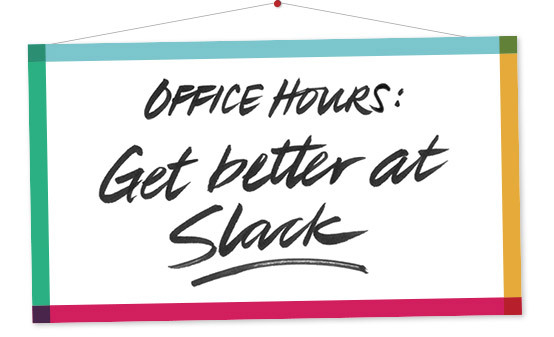 Either way, we believe the sooner your new teammates are up and running on Slack, the sooner they’ll be having an impact in their new workplace. Matt Haughey wrote a game inside Slack that every new hire gets to play (which secretly teaches them a bunch of advanced search techniques).